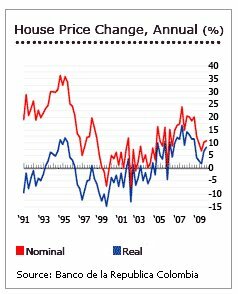 Colombia's house prices have been heading up, rallying by 10.71% (8.21% in real terms) during the year to end-2009, according to the Used Housing Price Index published by the Banco de la Republica Colombia. We report on the Combian housing market's rapid appreciation briefly here. House prices have been rising strongly since 2006. Double-digit growth rates were registered until end-2008. The country’s housing market sailed through the global financial crisis, thanks to improved security conditions, the rise of fixed-rate mortgages, and more cautious investment decisions. The government’s measures to restore peace and order in Colombia have been generally successful. Consequently, investments have increased and tourism has significantly improved. Despite the global financial crisis, President Uribe proudly announced that Colombia had successfully attracted $8.5 billion-worth of foreign direct investments in 2009. Tourism was the best performing industry in 2009. The valuable lessons imparted by the Colombian housing market crisis of 1999 helped shield the local market. Buyers financed their home purchases by fixed-rate mortgages. Developers were very careful in initiating construction projects, making sure to supply only just enough. Colombia’s economy grew 2.45% in Q4 2009, ending the country’s year-long recession. Interest rates remained low at 3%. However, the high jobless rate of 12.40% in April 2010 poses a challenge. Nevertheless, house prices are expected to rise further in 2010. The Colombian Peso has appreciated from US$1=2,600 pesos in March 2008, to US$1=1950 pesos today. Now the big drama is the Colombian Presidential election. The first round of balloting was held on May 30, and the second round will be held on June 20. The election pits the conservative 'Urubista' candidate former defence minister Juan Manuel Santos, against the Green Party's Antanas Mockus. The Green Party was formed as a moderating force in a country polarized between a miliarized right-wing and a militarized left-wing. In the first round, Santos received 46.68% of the votes, versus Mockus' total of 21.51%. Either candidate would probably be equally acceptable to international investors.